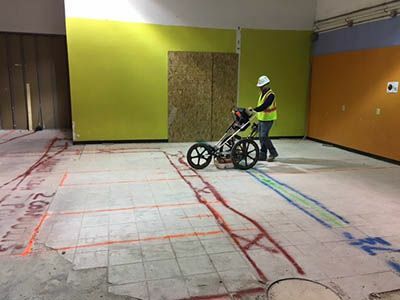 Ground Penetrating Radar Systems was called by a local contractor to conduct a concrete scan at a building renovation project in Columbus, OH. The scope of work was to locate and mark out any conduits that were in the proposed saw-cutting locations, as the project required the contractor to saw-cut several locations so that they could install new electrical conduits. After discussing the scope of the project with the customer, GPRS Project Manager, Mitch Streight used GPR equipment to locate and mark out the conduits that were in the saw-cutting locations. During the scan, Mitch locate conduits that were embedded in the concrete, and the shallow utilities that were located just beneath the concrete slab. This project was completed this project in a timely matter so that the project could remain on schedule, and thanks to the accurate, and timely results that we provided to this contractor, the saw-cutting was finished without any issues.